When a couple falls in love, often times they do not think about what impact their relationship may have on their families. It isn't until the relationship begins to get a little more serious and the talk of marriage begins, that the love birds start to think about how different their cultures or family wedding traditions may be. This is particularly true if there is a difference in religious views or ethnic backgrounds. Have you ever seen My Big Fat Greek Wedding? Well, all you have to do is replace the "Greek" with "Romanian," and you could have been at my wedding. We had the huge wedding party and the large reception. The day was filled culture, traditions, and "we must do it this way." 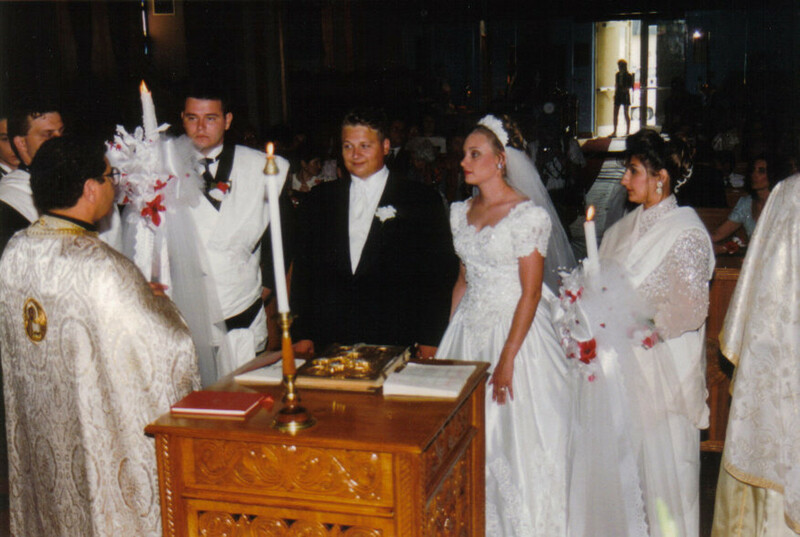 We were married in a Romanian Orthodox Church and had a large reception complete with traditional Romanian music. So how did my family blend with my husband's family? Well, it wasn't always easy, but we made it work. And, no, my mom did not bring my future in-laws a bundt cake! So here are some of the things that we did and some of the things that we learned along the way. Planning a multicultural wedding can be very tricky. Weddings are emotionally charged experiences for all involved. The bride has most likely been thinking about this day for as long as she can remember. The parents of both the bride and groom probably have a certain picture of what they expect this day will be like. In most cases the groom is just happy to go along with whatever the bride decides. So how do you fit in the expectations of all involved? The wedding does not just consist of the big day. 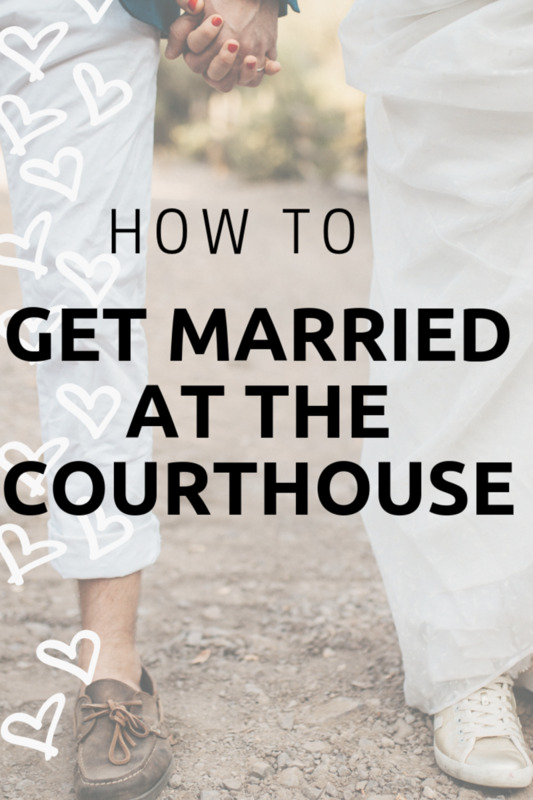 There are four major parts to the wedding that need to be discussed and considered. They are the pre-wedding day, the ceremony, the reception, and the post wedding day events. Pre-wedding day events can be anything from an engagement party to the wedding shower to the rehearsal dinner. Everyone has their own ideas about what parts are important. My husbands family typically celebrates the engagement with a gathering of the families few closest relatives and friends, in this case, about 100. My family traditionally congratulated the newly engaged couple but never really had a formal gathering. We decided to make this a part of the celebration because it gave our families a chance to get to know one another prior to the big day. It was a great time because we kept it very informal by having a pig roast and bonfire at my husband's grandparents' farm. Our planning was off to a great start! 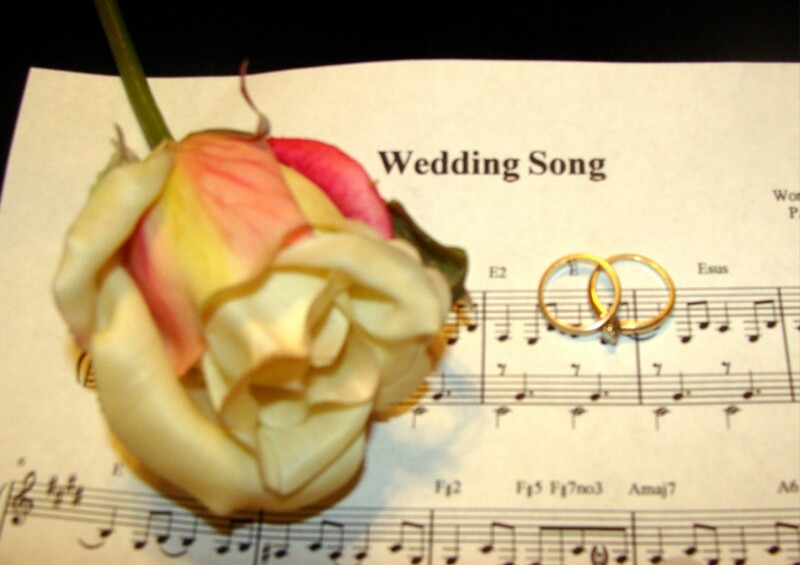 One issue for many couples and families is the wedding ceremony. If you are blending two religions, there will likely be lots of discussion around what faith the ceremony will take place in. Many priests and rabbis are willing to share the blessing of the marriage and have some sort of combined ceremony. In my case, I was raised Catholic while my husband was Orthodox. Since the two are very similar, there was not a lot of compromise needed for the ceremony. I did not have a church that I felt truly connected to and my future inlaws did. We decided that we would marry in the Orthodox Church. One thing that I did find very important was that part of the ceremony was conducted in English. This was a big compromise for everyone since some of my husband's family did not speak English and none of my family spoke Romanian. We were able to find a second priest who spoke English well enough for everyone to understand him and be able to enjoy the ceremony. The ceremony was a very traditional one. It was very ornate and full of symbolism. Many of my family members found it quite interesting. 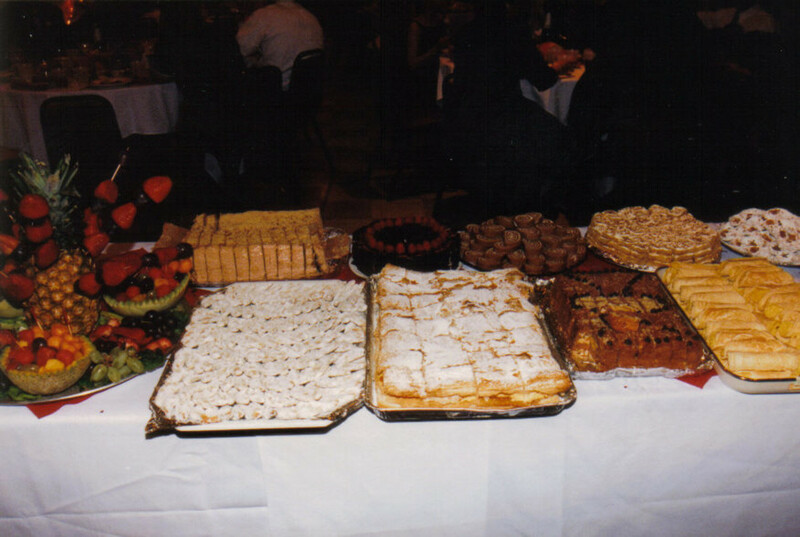 The dessert table, complete with traditional Romanian sweets. At our reception we kept with the tradition of having Romanian music. I knew that was a very important to my future in-laws, however my family loves to dance as well. Even though I knew my family would embrace the ethnic dancing, we compromised by also having a DJ. This allowed both families to have to dance to their favorite tunes. in addition to the music, we had a little change in our dessert menu. 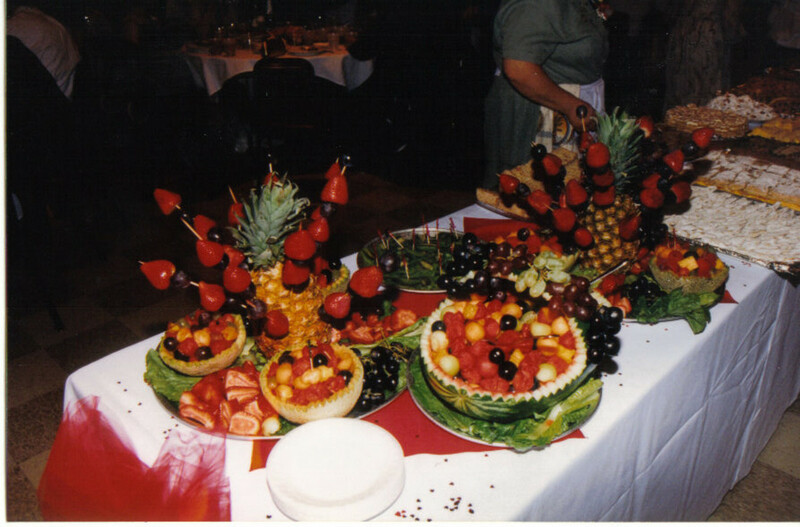 Not only did we have a wedding cake, which was important to me, we had traditional Romanian desserts. Many of the ladies spent several days baking the sweet treats to share with the guests at the wedding. Not only were they delicious, but it was an honor to have all of that work put in for your special day! Most times, the wedding doesn't end on the wedding day. Many family members from far away have come to celebrate the big event. Many couples opt to have some sort of gathering the next day. We had people that had come from Arizona, North Carolina, Canada, and New York. 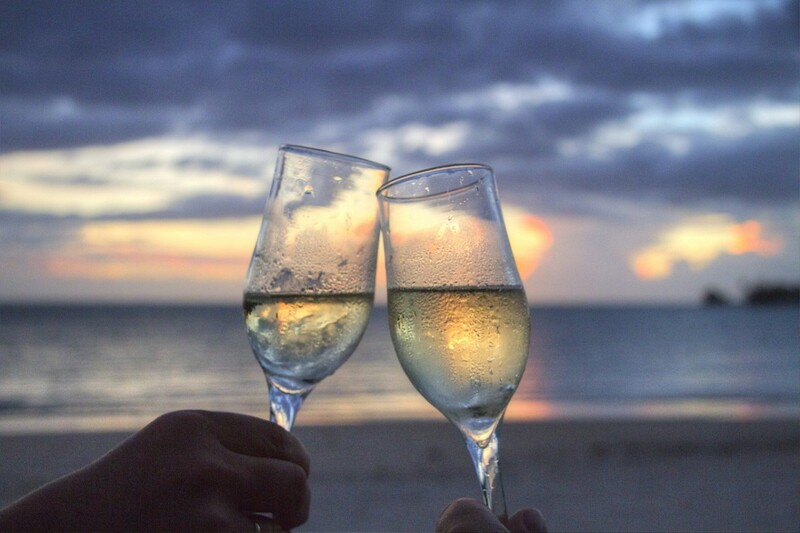 My husband and I decided to post pone our honeymoon by a couple of days to spend time with the wonderful people who had come from such distances to celebrate our special day. We had a special lunch for all of our out of town guests and were able to spend some quality time with them. So what tips can you use as a guide in planning your own multicultural wedding? Here are a few to help you out. My first tip is that you have a conversation with all parties involved about what each person expects the big day to look like. The financial part of the wedding is not the only that needs to be discussed. It is important that all traditions and ideas are presented at this time so that there are no misunderstandings down the road. The more honest that everyone is about what each expects, the smoother the day will be. If anyone is holding back and "surprises" others down the road then trust will be broken and everyone will be walking on eggshells for the duration of the wedding planning. As with all differences, there needs to be an element of mutual respect for what each side holds important. Family traditions and religious practices are important to the people that hold them dear. Keep an open mind as you move through the wedding process. Some of the traditions may be things that happen prior to the wedding day like a gathering of family a day or two prior to the actual day. Who knows, not only might you learn something new, you might actually like some of the changes. Be prepared to compromise. 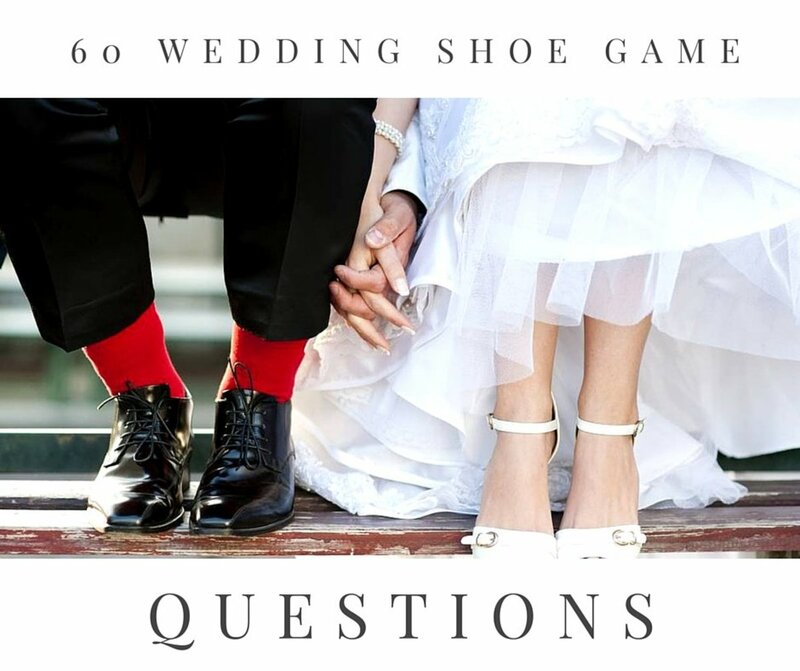 With every wedding there is an element of give and take whether it is financial or location or something else that you may feel is a critical component of the wedding. In multicultural weddings, often times there is even more compromise that is needed. Change is ok, change is good. Although it may seem like the world will end if you do not do it a certain way, you most likely will not remember it down the road and your guests definitely will not. In the end the wedding will be beautiful and the tough decisions that had to be made along the way will be forgotten. As long as everyone is enjoying themselves then the wedding will be a success. Learn to let go. If things do not go quite as planned on the wedding day, don't obsess about it and allow it to ruin the rest of the event. Take it in stride and release it. Most importantly, if the bride and groom are carefree and having the time of their lives then it will be a day that will live in their hearts forever. And if all else fails in the planning...DESTINATION WEDDINGS!!!! I am marrying a Romanian man in a years time and I am English, I'm having trouble, my fiancé says that in Romania the bride and groom walk down the aisle together at the beginning of the wedding, I really want my dad to walk me down the aisle and this is the only thing that I really really want, to uphold my own traditions. He reckons that they won't allow that in his orthodox church in romania, surely they could let me have this one tradition of my own? That is NOT Romanian music! Just got engaged- Thank you for the website! Great ideas! Cara, I saw this on the feed and had to return. Love this hub and love the photos. Boy...you two look so young there. :) And beautiful. Thanks Jools99. It was quite an event for all. There were some hiccups along the way but we really enjoyed ourselves overall. Thanks so much for reading and commenting. Cara, what an interesting hub (your mum pointed me over here) :o) The mixture of culture and traditions must take some organising I imagine but your photos show that you carried the whole thing off with aplomb! Gorgeous dress and your groom got to wear a crown? Wow, it must be a real spectacle. It was also very nice of you to postpone your honeymoon to spend time with those who had travelled a long way. Thank you for the so very kind compliment ishwaryaa22. We enjoyed are day very much. I'm glad that you enjoyed reading about it. Everything in this hub from photos to description of your wedding events and advice are extremely engaging! You and your Prince Charming made a wonderful couple! You looked very pretty! Thank you for sharing your Romanian culture with us! Well-done! You're welcome KDuBarry03. Since both of our religious beliefs are Christian based, there are not a lot of differences in our holidays. The biggest one is that Easter is not always celebrated on the same day. So on the years that it is different, we celebrate Easter with my family and then again on the Orthodox Easter with my husbands family. But for the kids sake, the Easter bunny always arrives on the "American Easter!" Aww, thanks Martie! I appreciate your kind words and visit. Absolutely awesome and interesting. Thanks for sharing, carelean. Voted up to the stars! 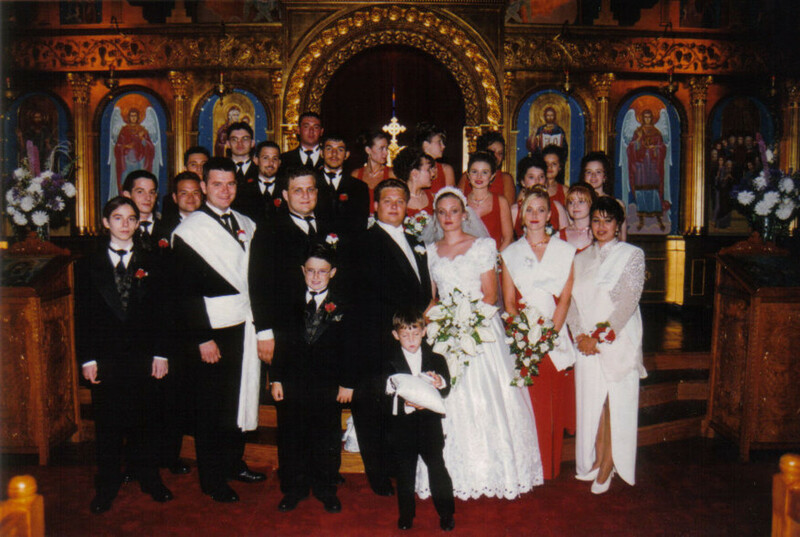 Cara, I confess I loved My Big Fat Greek Wedding and your article laid out great tips on how to blend cultures and family traditions when getting married. My husband and I are both Roman Catholic, but his family was definitely more religious than mine. And just as you said there family was definitely more partial to their church. So for my husband and his family we got married in his church. I felt this was a compromise I could live with and the least I can do. So, you are very much right when you talk of compromise as a tip here. Have of course voted and shared too!! You are welcome Danielle. I didn't plan my wedding from afar since my husband grew up in the same area as I did in Michigan. However, I'd be happy to help you out in any way that I can if you are more specific with what you are looking for. You can contact me through my profile page and I'll share everything that I can for you! Thank you for posting this, I am Canadian marrying a Romanian and I have been having trouble find information online to start planning. Can you tell me how you planned your wedding from afar? Resources and tips are greatly appreciated! Valerie, thanks for sharing your story. It is hard sometimes (I think for women especially) to be flexible and change what they have envisioned for so long on this special day. I enjoyed sharing our traditions and my family enjoyed learning some of his family's traditions. I wish you all the best in your wedding plans and day. The crowns are from the Christian Orthodox religion. I am not 100% sure of their origin but what I have been told is that is symbolizes the new husband and wife being the king and queen of their new home. 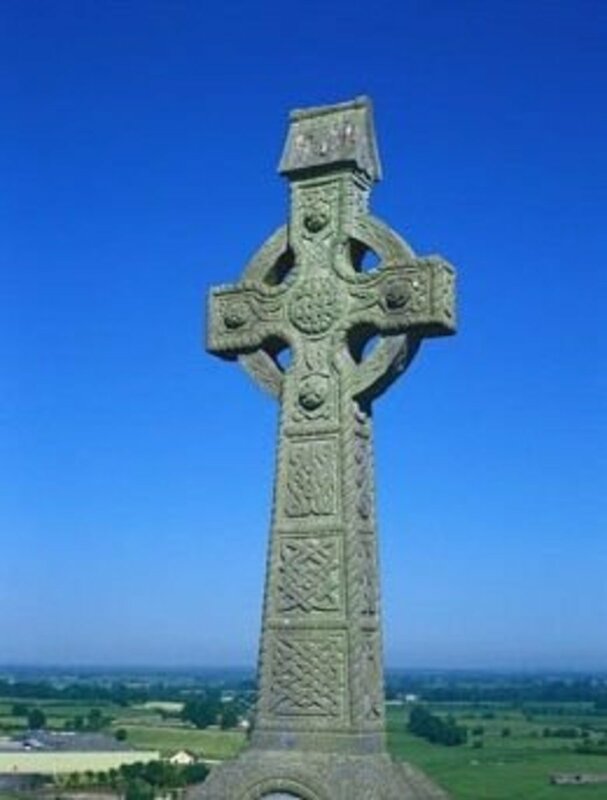 The Orthodox religion is very symbolic. Thank you for posting this. The man I will marry is Romanian, so this is helpful for me to get more of an idea of the kinds of weddings he is used to. Before I was very bull headed about having the whole wedding my way, but I realized I should not be so selfish in not considering what he might want. 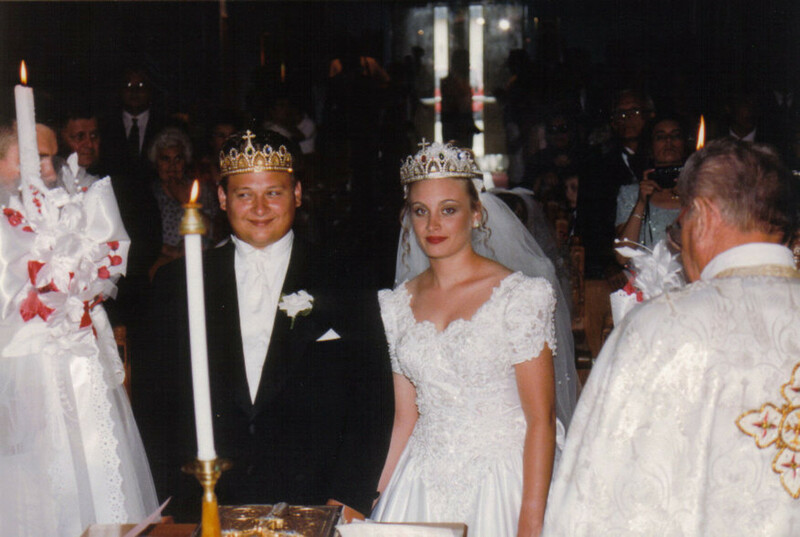 By the way, the Russians also have a tradition where they crown the bride and groom. It looks like a beautiful tradition, but what is that about? What does it represent? Hmmm...are they Romanian baptist? I know that some Romanians are against dancing, drinking, etc. If that's NOT the case, maybe they could compromise and if they don't want a Romanian band, have some CDs that they can play for some of the traditional Romanian music. Do you know what their reasons are? I think that it's great that she wants to honor their traditions but I would find out what the reason is before pushing too hard with it. Keep me posted...I'm curious! Hi Cardelean. 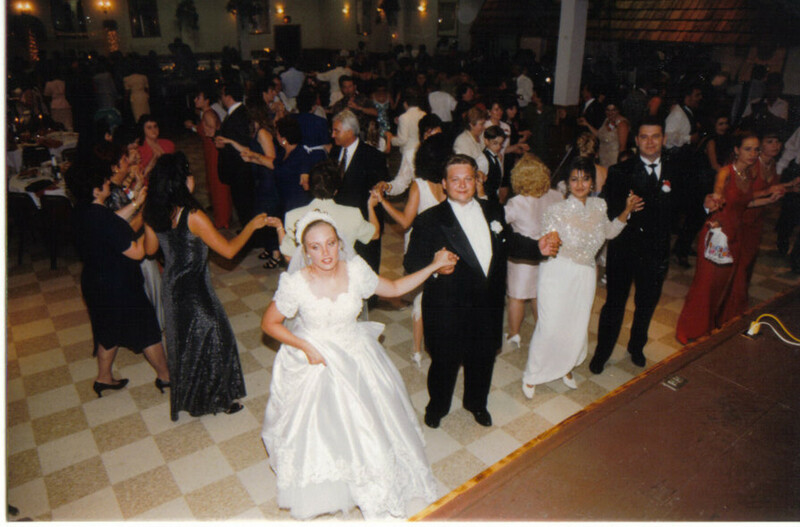 We have an unusual dilemna... My Italian girlfriend is marrying a Romanian and she WANTS to do it traditional Romanian but the Parents of the Groom (from Orange County California) don't want Romanian tradition.... no dancing... What should she do? Thanks Emily40! It was quite an experience for my family. I had already attended several weddings so I knew all about the traditions but it was all new to my family. I love learning about other cultures as well. Thanks for your comments. This was really great...And amazing, so nice to see different cultures and their traditions.Thanks for sharing! You are right HBN, they are great tips for marriage as well. Thanks for pointing that out. I'm glad that you enjoyed it. As I read your 4 wise tips for planning a multicultural wedding, it struck me that these same tips are also great advice for marriage. Add love and you have a winning recipe for a long, happy life together. This hub was awesome and the beautiful photos of your wedding made it particularly special. I rated it up, useful, beautiful and awesome. I can't believe this hub didn't win! LOL Great job, just the same. Thanks for the tips. They make a lot of sense. Thanks for the comment Sarah. I think I paved the way for you :) but I am thankful for that. I am lucky to have you as my sister in law! Thanks Aunt Danette, glad you enjoyed it. The bride is beautiful of course - now and always! A very useful hub especially with June weddings coming up. Nicely illustrated with photos and just enough video to be useful. This hub made me thankful for my in law family and the flexibilty they allowed for me to handle the cultural differences and the cross country distance. Thanks family for the wonderful comments and Sarah for the share on FB. I appreciate it. Mom, a special thanks to you for the suggestion. I may have outdone myself but it still didn't snag a win! LOL. I thought if I did win today then I would have had to share my winnings with you. :) Anyway, glad all of you enjoyed it. OMG What a wonderful hub read to come home to. Thanks ! Excellent job, Cara. This turned out fantastic. I voted it up and awesome, etc etc. Wow, did this bring back memories. 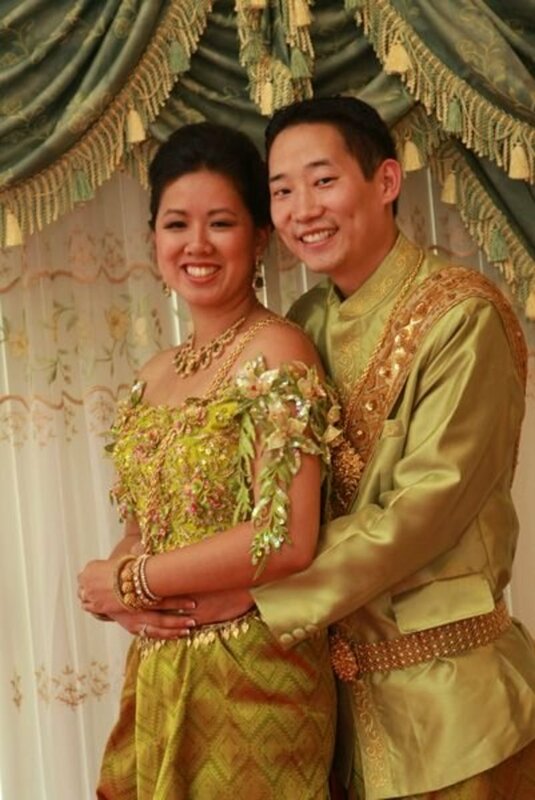 As Docmo said, the photos are of a radiant couple in beautiful garb. Thanks for sharing. You really outdid yourself on this one. You made your Aunt cry again. Beautiful tips and wonderful pictures. You were a beautiful bride. I love the title of your hub! Thank you for adding the beautiful pictures. It was such a lovely wedding. I remember it vividly. Well organized tips, too. Voted up and shared on FB. Thanks Simone, it was great. Thanks for the feedback. Oh, what a beautiful wedding you had! Great Hub, and excellent advice! Why thank you for the very kind compliment Docmo. Yes they are my pics of my wedding. The videos I found on youtube but the pics are original. Thanks for the comment and vote up! What a brilliant hub- this is wonderfully illustrated with pictures too. Are they your pics - the groom looks so radiant and the bride ever so beautiful. this is great advice for multicultural gatherings- voted up/awesome!